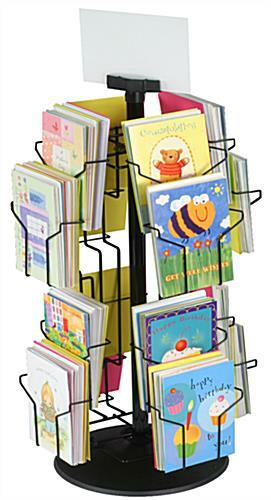 These Greeting Card Stands Have 16 Pockets. 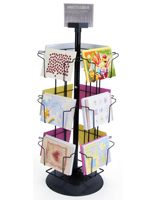 These Wire Rack Shelving Units are In Stock and Ready to Ship! 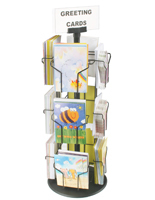 These Greeting Card Stands Have a Sign Holder for Custom Messages. Spinning apparatus makes browsing easy. 16 areas for merchandise up to 5" x 7". Customizable sign clip for messaging. 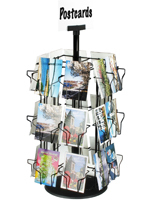 This wire rack shelving sits on a countertop so the goods are at eye-level for customers. 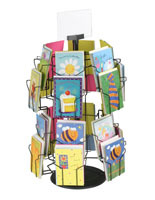 These greeting card stands have a spinning base to make it easy for patrons to peruse the selections. Order these units for retail supplies by 1 p.m. today and expect same-day shipping! 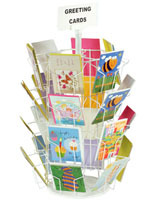 These greeting card stands can be placed on a countertop near a register to encourage last-minute sales. 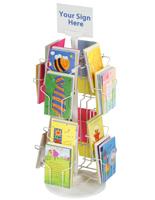 These wire shelving goods accommodate 5"wide x 7"high standard size greeting cards. 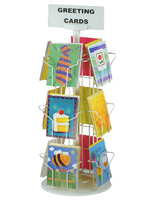 These merchandising supplies, greeting card display tools, are sold with a sign clip for a custom message that can be changed out according to season or specialty. 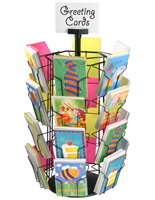 These greeting card stands are (4)-sided with (4) pockets each, which means (16) opportunities for showcasing merchandise! 5.5" x 4.5" x 1.5"